Adding stone walls to the interior of your home is a fantastic design choice that can accomplish any look or style you can imagine, from traditional or rustic to modern and elegant, stone veneer is a versatile design choice. At Eldorado Stone, we offer a variety of stone options perfect for any room in your home. If you’re thinking about installing stone walls in your home during your next renovation project, it’s important to carefully consider your options and ensure you’re prepared. As you may have guessed, stone veneer weighs more than paint, so you will need to follow the proper installation techniques and ensure a durable, long lasting stone wall. In addition to following the proper installation technique for your wall type, you’re also going to determine whether or not any additional framing or construction will be necessary. In some cases, you may choose to build onto the existing wall in order to create an accent wall with depth and dimension. The example below has recessed openings for candles or other objects..
After you’ve chosen your stone wall design, you’ll need to consider electrical outlets and switches. When adding stone veneer to a wall, the depth of the electrical boxes can be adjusted to reach the face of the stone for a clean appearance and accessibility. Considering these questions before your installation begins will save you time and create a better finished stone wall. 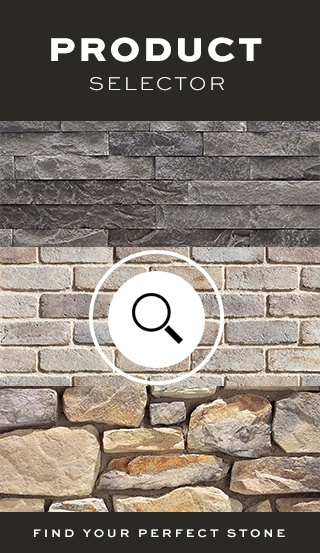 Once you’ve selected the perfect wall in your home, you’ll need to determine the look and feel of your new stone veneer. One of our most popular veneers is Stacked Stone that features intricate detail created by small ledgestones. It is a panel system that gives the appearance of many small stones individually laid in a tight dry-stack installation. In reality, each panel is 4" tall with different lengths which allows faster, easier installation without compromising believability. The panels are disguised by the variation in stone lengths and depths creating a stunning stone wall. Visit our online gallery to see our selection of different stone shapes, textures, colors, and installation techniques. Once you've decided on your stone and your design, it's time to either hire a contractor or put on your DIY hat and get to work. Watch our installation video and read through the installation guidelines for your particular wall type. Depending on if you're installing on the interior or the exterior, or your walls are wood framing, metal framing, or something else, your installation technique will change. How you lay the stones will depend on which stone shape you’ve selected. Before you start placing stones, make sure you have the necessary tools and supplies and that you know how to mix your mortar correctly. As a general rule, you want to orient stones on the wall the same way traditional stone masons lay full depth stone. For example, long ledgestones should run horizontally and appear to bear the weight of the stone above. 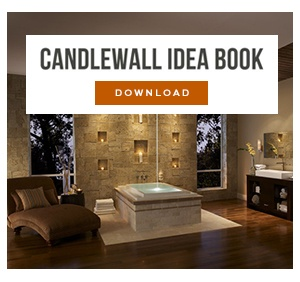 You can check our website for more in-depth guides about how to install your stone walls. For stones adhered with a grout joint, consider your finishing options carefully as the color, texture, and grout technique have a considerable impact on the final appearance of the stone wall. The width, depth, and finishing technique of the grout will quickly change a stone wall from rustic to refined. We recommend building a small mock up with your stone and your selected grout technique before installation to ensure you achieve your desired look. With the right amount of preparation and care, you can create something truly stunning. Eldorado Stone is happy to help our customers who want to learn more about stone walls and how to properly install them, so get in touch with us for more information. You can also browse our photo galleries for inspiration and ideas for your home.